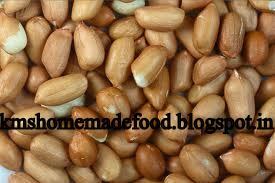 Delicious , crunchy and nutty peanuts are the well known oil seeds to humankind through out the world . Both lady finger and peanuts you can eat either directly (raw) or cooked , both gives awesome taste . 1) peanuts are rich in energy and containg many health benefiting vitamins, nutrients, minerals which are essential for good health . 2) Presence of calcium and vitamin D are helping bones . 3) Vitamins and Minerals: raw peanuts are sources of vitamin E, D , niacin , folate , riboflavin and vitamin B6.And also small amounts of zinc , phosphorus , potassium , calcium , sodium and iron . 4) niacin helps in the brain health and in blood flow. 5)Peanuts are significant source of risveratrol . It will helps to reduce cardiovascular diseases and cancer. So people from all over the world are using peanuts in their regular food in the form of raw, cooked , roasted and even in the form of flour as it is containing around 30 essential minerals. 1) Heat oil in a deep pan , add peanuts and fry them for 5 mins on slow flame until they become brown colour and take them out from oil. 2) Now add mustard seeds ,chopped onion and green chlli after small break add ginger garlic paste fry them until it leaves raw flavour. 3) Now add lady finger , fry them till the half cook is done now add salt , red chilli powder,coriander powder, turmeric powder . 4) After 80% of cooking is done add fried pea nuts and mix them real good . Serve it hot as with regular meals. It is very good stuff for liquor. Enjoy this recipe with your regular recipes . Thanks for giving information about health benefits of peanuts and good healthy recipe that is Lady Finger With Peanuts Recipe. 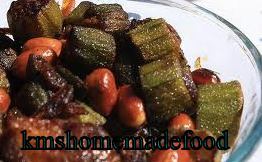 It is very delicious and crunchy recipe.